"Tension headache medication" is what my patients say when I ask some of them how they treat their daily headaches. What they don't realize is that these types of drugs, even if over the counter, may not be the best answer. Sometimes it is very difficult to tell the difference between a tension headache or a migraine. While tension headaches are the most common headache type the fact that nausea may accompany either headache confuses things. Other aspects of tension headaches that are confused with migraine are that scalp muscle tenderness (called cutaneous allodynia) is seen in both types of headaches. A tension headache feels like a band tightening around your head. The sensation is almost as if you are wearing a hat that is too tight. Other symptoms include nausea and perhaps even feeling that the light is bothering your eyes (photophobia). Did you know that the lowest incidence of tension headache is in China? Is is because they practice relaxation techniques in the east far more than westerners? Tension headaches can limit your ability to perform daily activities. If they occur more than 2-3 times a week you may be moving into CTTH (chronic tension type headache). This can be a form of chronic daily headache. 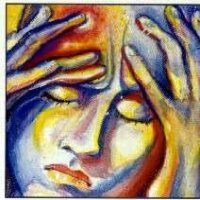 When headaches become chronic then they are a form of invisible chronic illness. Most of the time, tension headache treatment involves a small dose of an anti-inflammatory such as ibuprofen. Your doctor might even recommend a low dose of an anti-spasmotic. A good tension headache medication is tizanidine (Zanaflex), which is out of your system in 10 hours or low dose nortriptyline which has less sedation than amitriptyline (Elavil). I am not a big fan of cyclobenzaprine (Flexaril). It has a 36 hour half life which means it takes 36 hours to get half of the drug's dose out of your body. That is a long time and if you were not aware of this, it could potentially interact with other medications causing excess sedation. It also has the potential to interact with alcohol, so that dose that you took yesterday could interact with today's glass of wine. Chronic tension headaches that have moved into daily headaches, may respond very well to low doses of amitriptyline,(Elavil) or valproic acid. (Depakote) Often this is due to overuse of OTC tension headache medication. If your headaches are more severe, then you need to look at the cause of these headaches...(here we go again!)...stress. Lifestyle changes in response to stress, can go a long way in helping with your headaches. Also you need to look at the possiblity of anxiety and depression fueling these headaches, much the same as they do in other headaches and chronic pain. Counseling is an excellent way to help you develop coping skills when overwhelmed with stress. Visit completecouselingsolutions.com to find a therapy solution that works best for you. Another excellent coping mechanism for tension headache is learning biofeedback for stress reduction. Through this you can learn to manage your pain and even break a headache at the onset. I have many patients who participate in biofeedback with excellent results. If you live alone, this too is an additional stressor. Lack of human touch has been shown in psychological studies to increase the risk of depression, which in turn creates more pain. Single people need to make more of an effort at times, to get out and socialize. Sporting activities as tolerated is a excellent way to accomplish this by reducing headache pain overall and increasing sense of wellness. Some providers recommend anti-depressants such as SSRI's. The medications in this class, paroxetine (Paxil),venlafaxine (Effexor) and fluoxetine (Prozac), are generally not an effective tension headache medication. However, if depression and anxiety are fueling the problem then they should be considered. It is important to treat all aspects of the problem, not just the headache itself. One of the best ways to remedy this is to have massage therapy on a regular basis. Now I am not saying weekly, especially if cost is an issue. But a massage once every month or two can go a long way in reducing stress. Finally, you might want to consider having your provider do trigger point injections. These are done in the trapezius muscles and usually are quite sucessfull in treatment of tension headache. Over 90% of the time in our clinic, we see that this is related to neck pain and taking care of that problem relieves the head pain. In any event, you should discuss your options with your health care provider and perhaps consider being seen by a headache expert, to discuss full treatment including tension headache medication. Remember to give all treatments several weeks to months to have their full effect. You did not develop this problem over night and it can't be solved that quickly.